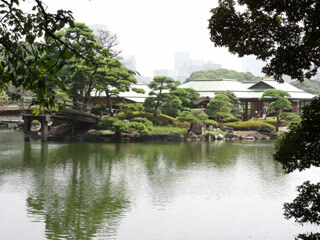 Hamarikyu Garden (Hamarikyuuonshiteien, 浜離宮恩賜庭園) is Japanese style of garden located in Shiodome Tokyo. It was used to be separate garden for Shogun Tokugawa, and also it was the fort of Edo city during the Edo period. Then, it became a part of Imperial garden. In 1946, it was opened for public. It has traditional style of garden, great pond and flower gardens. In the middle of pond, there are tea house where you can enjoy Japanese tea. This garden was chosen as the special place of Japanese scenery and special place of historic monument. Admission fee: 300 yen, 150 yen for over 65, free for kids. This park was well designed for handy cap people. There are flat road for wheelchair person. Check out the Japanese garden with the history nearby Tokyo Station. Not only history and Japanese garden, you can enjoy beautiful japanese flowers and wild birds. It was used to be a part of separate garden for Shogun Tokugawa. It was also used as the fort of Edo City. In 1654, it became also falconry of Shogun Family. The brother of 4th Shogun landfilled the beach and built the house with garden. Since his son become 6th Shogun, it named "Hama Garden." Up until, 11th Shogun, it had kept expanding and building the house and garden, and finally had become the shape of current garden. In the Meiji Period, it became the part of the Imperial Garden. In 1946, it became public park, and 1952, it was chosen as the special place of Japanese scenery and historic monument of Japan. It was also used be the place of hunting duck. You can see those old style duck traps built in 1778 in this park. The black pine tree at the entrance is about 300 years old planted by 6th Shogun. There are 60 kinds 800 tree peonies, in flower garden. They blossom out at spring. The flower garden has also many other flower of seasons. The tea house at middle island was built in 1707 for Shogun. You can see the same scenery of the garden from 18th century. The current tea house was rebuilt in 1983. You can still enjoy tea and sweet here. This park is also a ferry for sea bus. You can transfer to Asakusa, Ryogoku, Kasai and Sakurabashi.